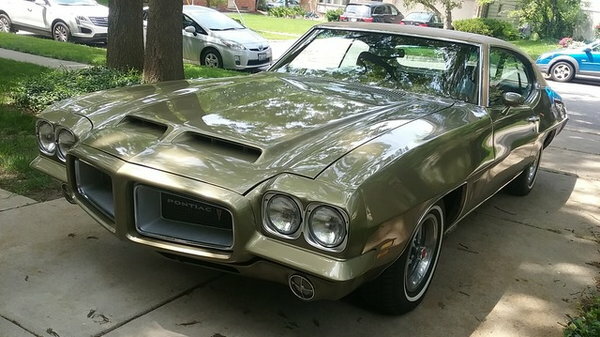 1972 Pontiac LeMans was purchased new in 1972 and kept by the original owner until recent passing. I then bought the car from the Estate in 2018. Power comes from a 350 Pontiac V8 backed by an automatic transmission, and the car is optioned with air conditioning, power steering, power brakes, AM Radio, and a GTO appearance package along with new tires. The original owner had the car repainted in its original color about 15 years ago and also fitted a replacement vinyl top. I have approximately 10 years worth of service documentation from the same Ann Arbor, MI service shop. The original owner kept up on all service required and spent approximately 6k in the last 3 years. This car has < 47k original miles and was always garaged/cleaned/covered when not used- primarily for weekend events. The car is available and physically located near Medina, OH.